A rare military watch that was left in a drawer for over 75 years has sold for a hammer price of £42,000 in a Birmingham auction room. The historic Panerai diver’s watch head was acquired from a Germany ‘Kampfschwimmer’, a military diver during WWII. Captain Alfred Packer of 43rd Reconnaissance Regiment attained the watch during Operation Market Garden in the Netherlands, in September 1944. The watch was kept in a drawer by his son ever since, without being worn. The Panerai was estimated at £20,000 to £30,000 in auctioneer Fellows’ Watch Sale on April 2.. 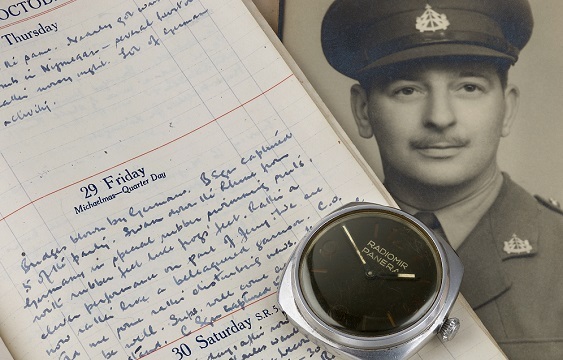 The watch was sold with Captain Packer’s military issue jacket, photograph, military service records and a fascinating personal diary depicting the experiences of the regiment in 1944. The watch was passed down to Packer’s son, and personal diary entries show how Packer and others in his regiment contributed to the capturing of Kampfschwimmers. The watch has ‘Kurt Kohlrusch’ inscribed on the back of the case. It is believed that Kohlrusch was the German diver who wore it during the Second World War. There are records of Kohlrusch being captured and held as a prisoner of war. There was a lot of interest across the room, including phone bidders and bids from the internet. Bidding started at £18,000 and steadily increased until the bidders in the room joined the fray at £34,000. When the hammer eventually fell at £42,000 the room burst into applause, congratulating their fellow bidder on their success at securing this remarkable piece of history.